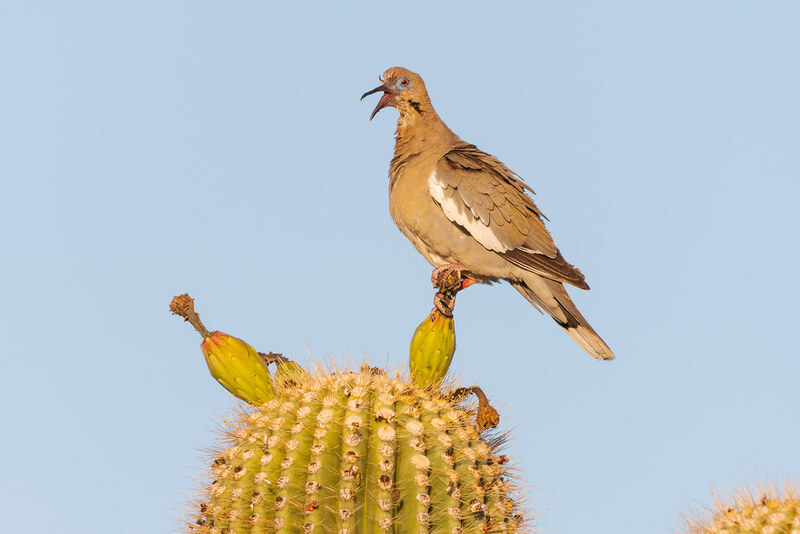 Last spring I was amazed at how many birds fed at saguaros as they bloomed and fruited, such as this white-winged dove sticking its face into fruit at the end of an arm along the Latigo Trail. 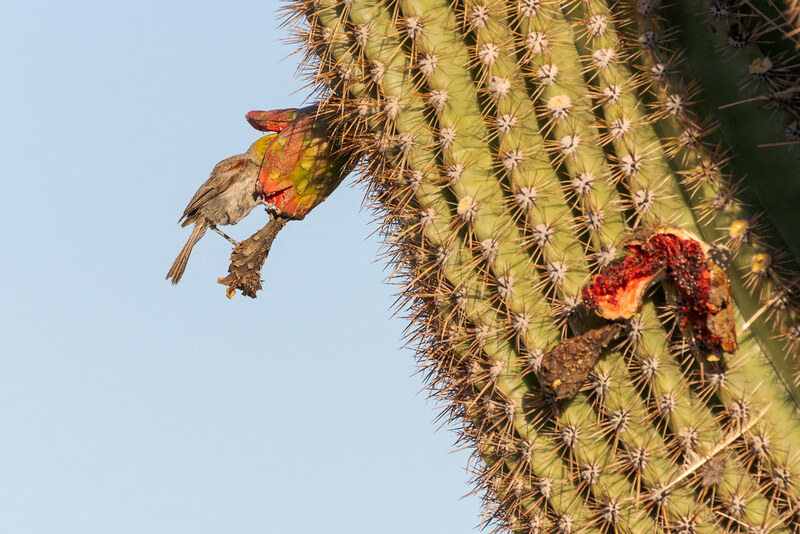 It’s a good thing saguaros aren’t carnivorous or a lot of birds would lose their heads! 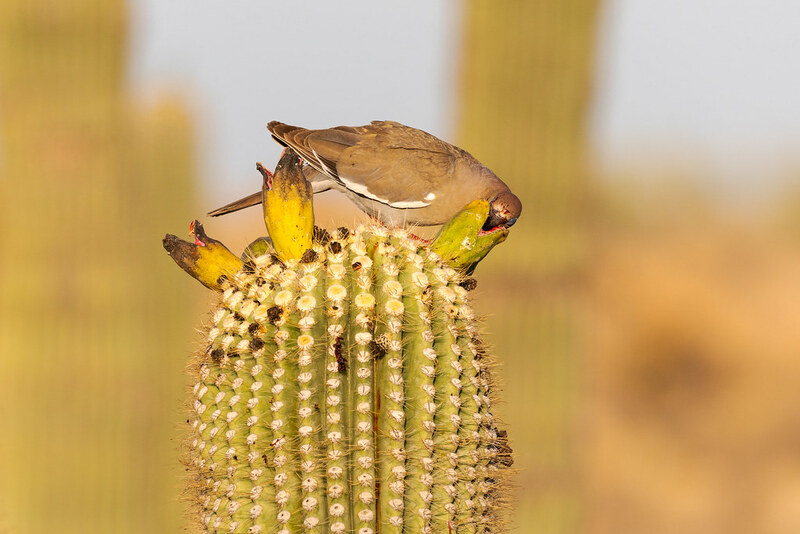 Cactus wrens are smaller than the doves but still large for wrens, this one stuck its head deep into a blossom on the saguaro where it was building its nest and raising its young. When it emerges its head will be covered in pollen, some of which will be deposited at the next blossom it visits. The tiny verdin had to stick most of its body into the fruit to feed at the back, in this picture it is feeding closer to the front and only its head is hidden. When the fruit ripens it is the white-winged doves that eat the most, but other birds enjoy the short-lived bounty as well. 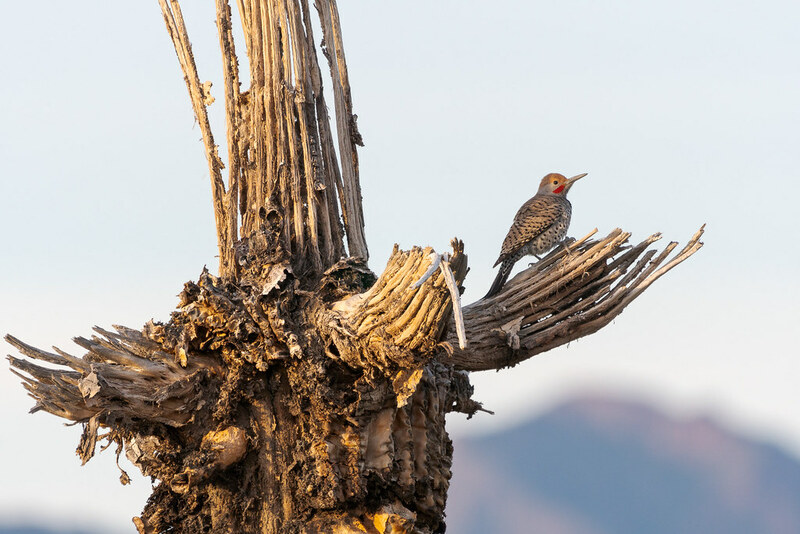 A male gilded flicker looks out over McDowell Sonoran Preserve from the broken arms of a dead saguaro. 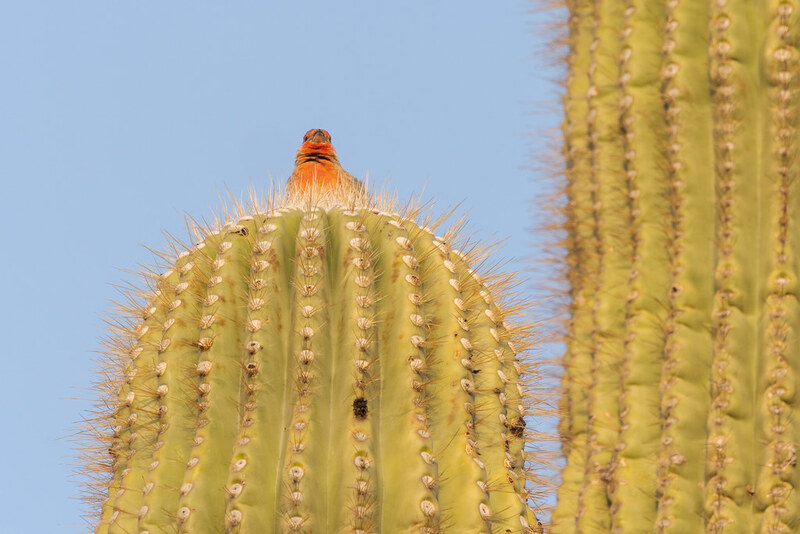 A male house finch greets the rising sun with a song from his perch atop an arm of a saguaro. 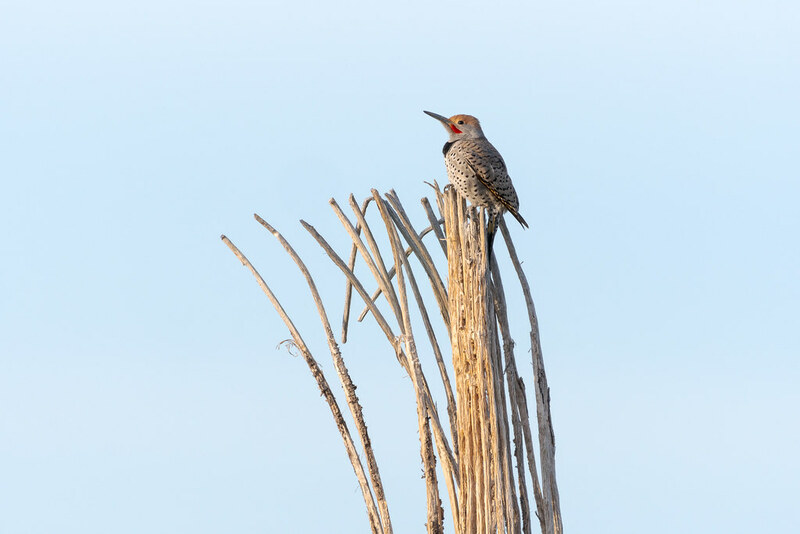 I met this male gilded flicker on a saguaro skeleton early on a winter’s morning on the Kovach Family Nature Trail, within walking distance of what turned out to be our second favorite house. While there is a lot of wildlife on the southern trails I don’t often see them this close, unlike some of the northern trails that are near our favorite house, the house which as of Thursday we now own. We move in a couple of weeks, we’re close to being home. We met the previous owners on Wednesday for a walkthrough of the house, they were lovely and I’m glad we had a chance to meet, they said there are several woodpeckers in the area, can’t wait to be introduced! They are likely either gilded flickers or Gila woodpeckers, I’m hoping for both! We close on our house in a couple of days. We have a walkthrough around lunchtime with the owners then take possession on Thursday and move in a couple of weeks. The white-winged doves will be home soon too, at least their summer home, although I’m not exactly sure when they’ll arrive. This one was feeding on saguaro fruit in July, I felt so much sympathy for them as their faces were matted with juice as they stuck their heads into the fruit to feed. As much as they like to be clean, they were going to be migrating soon and had to strike while the iron was hot. We spent yesterday with our realtor visiting a handful of houses we hadn’t seen plus our two favorites from prior visits. By the end of the day we were close to making an offer on our favorite but wanted to sleep on it. I went hiking this morning near my second favorite house and had a wonderful time and was satisfied I could be happy there, but all the same my overall favorite retained its crown. My wife felt the same so we met our agent this afternoon and put in an offer and the sellers accepted it! We’re both excited and exhausted! 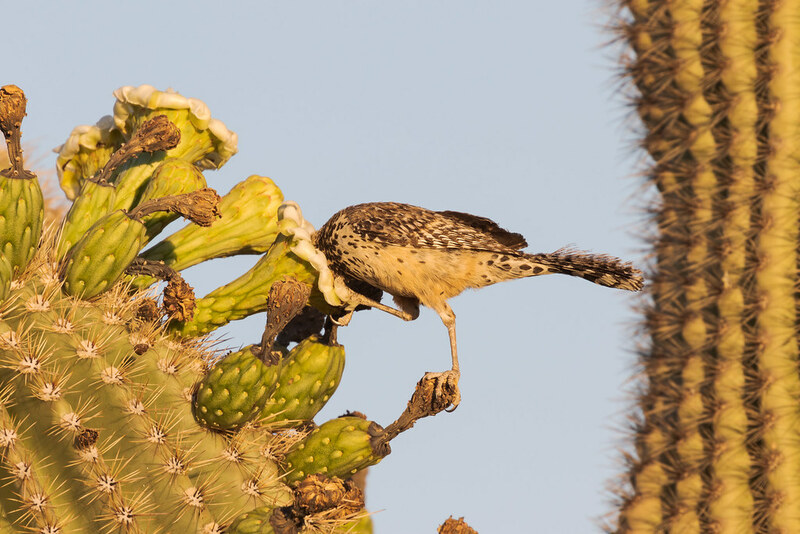 We first arrived in Arizona at the tail end of March, a month later I met this cactus wren early one morning as it built its nest in the arms of a saguaro. As it tried out the nest I assumed its home was nearly complete and that it was applying the finishing touches before eggs were laid and babies were raised. It showed how much I had to learn about my new home as the wrens still had plenty of work to do, building up the sides of the nest and putting a roof on top to protect from the desert sun, with an entrance in the side they could fly in and out of as they brought food in and took waste out. There is still work to be done before we take possession of our house too, we close at the end of February and will move sometime in March. But tonight it is enough to be thankful for the opportunity we had to come to Arizona after our time in Oregon came to an end, that we were able to leave one wonderful place and arrive in another. 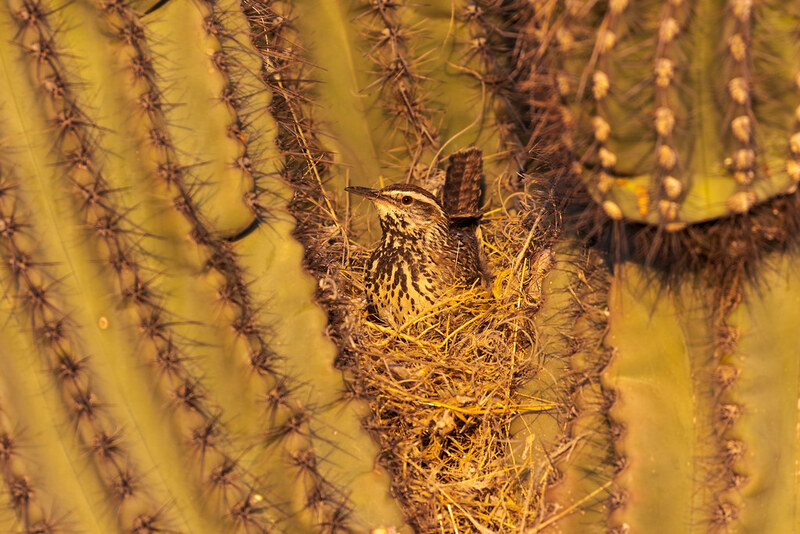 I’m thankful for that little wren and for that big saguaro, for helping me fall in love so quickly with the Sonoran Desert. 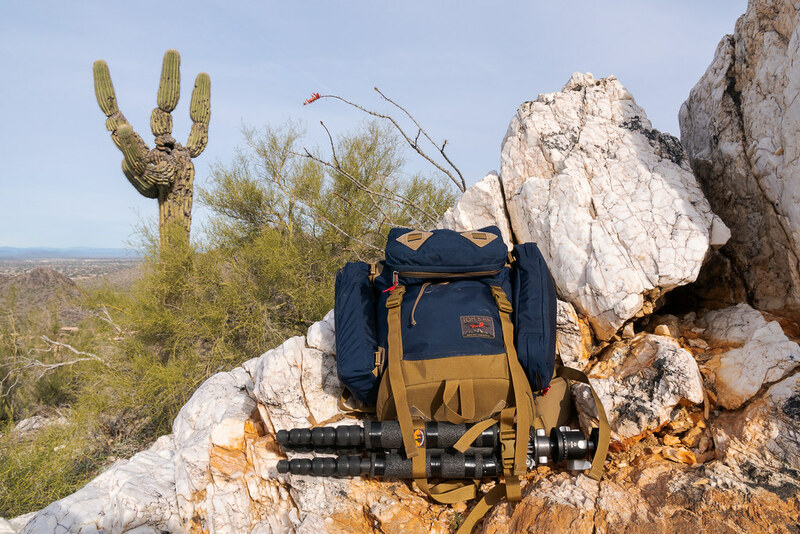 For the Gila woodpeckers, the gilded flickers, the curve-billed thrashers, the white-winged doves, the quail, the Gila monsters, the whiptails, the side-blotched lizards, the diamondbacks, the bobcat, the antelope squirrels, the cottontails, the jackrabbits. On and on and on. The desert is our home, soon a house will be too.